Remote controlled blinds and shades are a great option for those hard to reach windows or those with very wide dimensions. Because they are conveniently simple to use, and practical, motorized roller shades give you the option of having your blinds fully automated. You can open and close them at the touch of a button from a wall switch or from the comfort of your sofa using a remote control. Hitech-shades will integrate your shades with your home automated system coordinating all your security, lighting, air conditioning , shutters and windows. We will help you maximize the thermal comfort adding sensors and timers so your roller shades will work even when you are away. On the other hand, manual roller shades will help you to reduce energy usage in a very easy and affordable way, controlling the amount of heat and light entering your home or office. 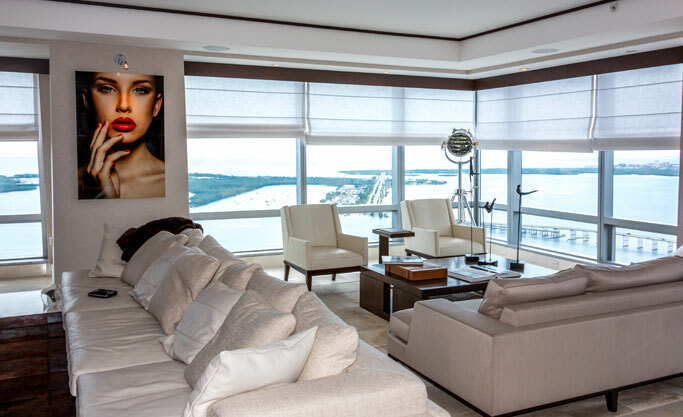 As they are specially designed to maintain natural light and enjoy privacy, our manual roller shades are handcrafted from top-quality materials to give you the perfect solution to reduce glare, available in hundreds of eco-friendly materials. All our shades are hung and tested before shipment and handcrafted in USA.